Is anxiety a sign of depression? What is your anxiety a sign of? Some say it’s a symptom of depression, I say it’s the other way around. Some say it happens when your life just isn’t going right, but I say it’s deeper than that. Today, I want to speak to you about anxiety and depression and whether anxiety is a symptom of depression or whether depression is a symptom of anxiety. Are you confused? I hope you won’t be confused by the time I’m finished. I’m often asked is anxiety a sign of a larger picture of depression and I tend to believe it’s the other way around. I know that there are a lot of people that have depression that also experience anxiety but I do believe that the two are mutually exclusive, which means you can have depression without anxiety and you can anxiety without depression. That’s completely doable and a lot of people do have that profile. From my personal experience and it’s probably because I specialize in helping women with anxiety through energy healing, I find that for many – pretty much for all of my clients – their predominant issue is the anxiety and the depression comes as a secondary part of that. So I do find in my experience that depression is a symptom of anxiety rather than the other way around. Let me just explain a little bit about why women who have anxiety do get depression do get depression as a symptom. 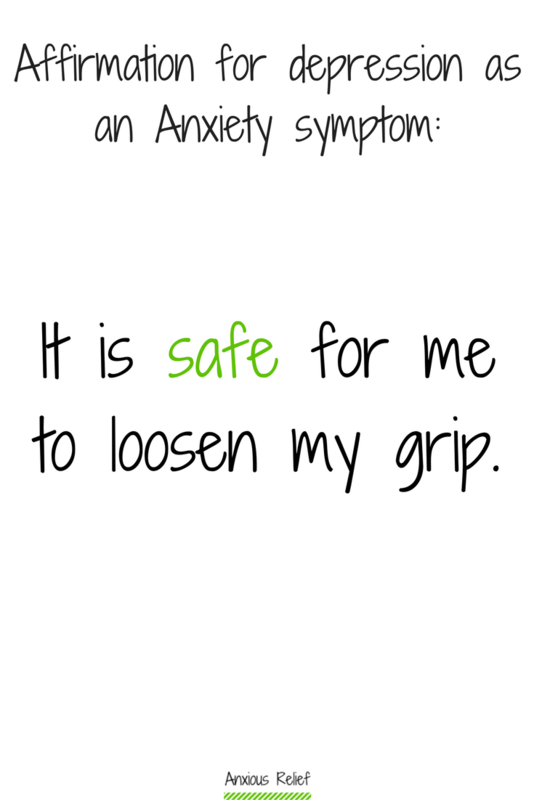 So, when you have anxiety, it’s caused by gripping on tight to what “is”. It’s trying to keep control over your life by gripping onto it. My butterfly: We ALL do it. We all have this belief that our reality is something that’s very concrete and that there are certain things in it that will never ever change. The only certainty in life is evolution and that things will change, albeit slowly. And there might be things, there might be a building that you see every single day of your life from birth until death and you might say that that never changes. But what does change is that building changes over time. So while the building itself might not fall down or the building itself might not change. There are small little changes that you might not even see. And that’s what life is: It’s living, it’s breathing, it’s growing, it’s always changing and anxiety is kind of the opposite of that in that a person with anxiety tries to grip on to what is in the mistaken notion that it is possible to grip on tightly to what is and therefore have power over it and have control over it. By doing that, you become inflexible and brittle. Instead of effecting lack of change in your life, what you’re actually doing is the opposite. So you’re causing a lack of control in yourself because the world is moving around you, the world will always be moving. And if you’re not moving with it, then that’s what causes the energetic mismatch that makes anxiety feel so horrible. Anxiety makes it feel so comfortable and makes it feel like you’d rather be anywhere but in your body right now. It’s because your energy is not matching the energy of the world around you. And this just comes from trying to hold on tightly to what is by gripping on and not being flexible. Is anxiety a sign of gripping too hard? Absolutely. If you hold too tightly for too long, you find that what was once strong then becomes weak. That’s when you find things like panic attacks begin to invade your life. When you’re going through panic attacks, they’re absolutely horrible and it feels like your life is being hijacked. This is just life’s way of making sure that you do keep moving. It’s impossible just to sit still where you are, holding on tight in the vain hope that you can control what’s going on around you. It’s just simply not possible. So, the way to release anxiety and depression as a result of the anxiety from your life is to simply release your grip on the need to feel like you have control. Release the grip on the need to feel like you have the ultimate power over what’s going on in your life. Also, release your grip on the way that you react emotionally when things ultimately become quite chaotic around you. If you only want one particular outcome, if you only want one singular control over your life, chaos will reign supreme. If you don’t stay on top of the signals that you’re putting out there, then you will just live a life and a world of reaction. This is because no matter what comes at you, you’ll try to control it which puts a misaligned signal back out to the universe which sends more chaos back to you. You then will react to it emotionally which means you put another misaligned signal out to the universe and that process will just rebound and rebound and rebound. This will continue until you come to the realization that gripping on to your idea of what is, is not only based on the ego, it’s based on an absolute fabrication, an absolute story. What you need to do instead is to relax every bone and every muscle and every cell in your body and just really ground yourself in the here and now. Really sink into the knowledge that no matter what happens, even if it feels like you’re out of control, you can cope with it. I know it sounds hard and I know it sounds almost out of this world to you and you’re wondering how on earth you’re going to do that. How you do it is by letting go, by losing that grip and by allowing yourself to relax. By doing that, you start realigning your signal, you start reconnecting with your intuition and you start to notice that the depression is beginning to lift and shift out of your life as well. I have got a really good meditation that I’d love for you to listen to you. It’s called the Space Between Your Brain Cells meditation. Listen to it when you feel that you’re so seized up from trying to keep control over your life that it’s making you super depressed and the feeling chaotic and out of control.